Drawings for a FREE home inspection and Gift Cards! An Informative FREE session guiding home buyers through the entire buying process. Perfect for first-time buyers, or those who just need a refresher. 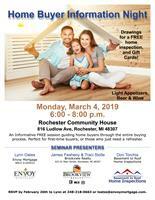 RSVP by February 26th to Lynn at 248-218-0663 or loates@envoymortgage.com.